Global banking giant HSBC says it could move its headquarters out of the UK in the wake of regulatory and structural reforms put in place after the 2008 financial crisis. The firm’s board has requested that management “look at where the best place is for HSBC to be headquartered in this new environment. “The question is a complex one and it is too soon to say how long this will take or what the conclusion will be; but the work is underway,” the bank added. While the question of where the under-fire financial behemoth will go is still open, experts predict a move to the Far East. “The only even faintly credible option is Hong Kong,” according to banking analyst Alex Potter. The move itself, however, may literally break the bank. “HSBC will pay several hundred million dollars more in tax in 2015 [if it stays in the UK], but it would cost several hundred millions of dollars to move the bank to another country,” Potter told the BBC. In a statement, the Hong Kong Monetary Authority welcomed the prospect of relocation. “HSBC is the largest bank in Hong Kong and has deep historical links with Hong Kong,” it said. It is not only the shifting economic mood which has made things difficult for the bank. 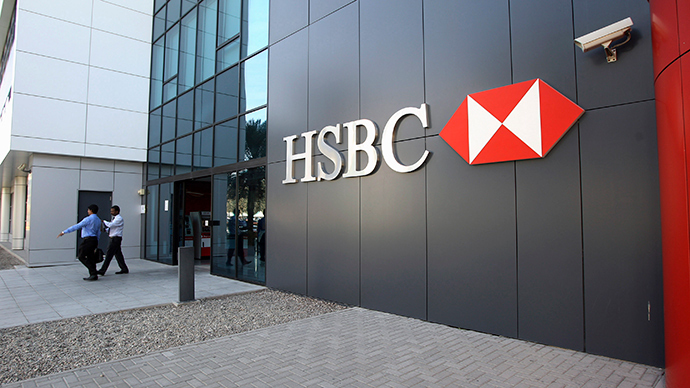 HSBC has found itself politically isolated in the UK – even among traditionally staunch supporters. Last month, following the recent HSBC tax dodging scandal and a drawn-out silence on the government’s failure to adequately address it, even free-market acolyte Chancellor George Osborne criticized the bank. Osborne conceded he had been aware of compliance-related concerns regarding the HSBC group since 2010. He said he was under the impression the bank had been passively aiding its customers in avoiding tax. He stressed, however, he knew nothing about HSBC’s complicity in tax evasion. “The only thing that I was aware of was what the public was aware of,” he said.